The Intersections & Beyond: Syoss Piso Sale (PhP1.00) for salon-beautiful hair on November 29, 2014 only! Syoss Piso Sale (PhP1.00) for salon-beautiful hair on November 29, 2014 only! Having salon-beautiful hair just got easier! In fact, all you need is just one peso (PhP1.00) to experience salon-quality hair care. 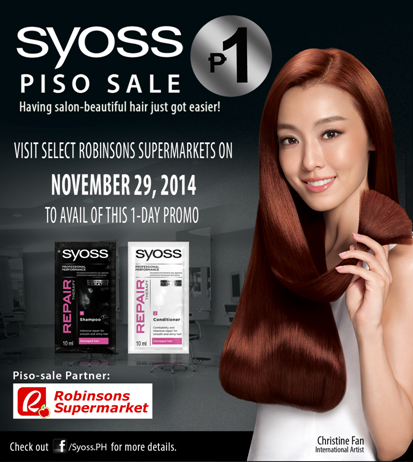 For just one day this coming November 29, 2014, SYOSS, a revolutionary hair-solution brand from Japan that brings salon-beautiful hair to every Filipina, will be having a one-of-a-kind promo called SYOSS PISO SALE. In partnership with Robinsons Supermaket, one of the leading supermarkets in the country today, Filipinas will definitely be delighted by this promo, for they can now easily achieve having salon-beautiful hair everyday for only one peso. Avail of any SYOSS shampoo and conditioner for just P1 per sachet by visiting participating Robinsons Supermarket outlets near you, that include branches at Galleria, Ermita, Las Pinas, Magnolia, Metro East, Pioneer, Imus, Antipolo, BF Paranaque and Nepomall. SYOSS is a Japanese hair-solution brand that brings salon-beautiful hair to every Pinay. Made by Henkel Beauty Care, SYOSS is co-developed and tested by top Japanese professional hairdressers and stylists. It offers hair care, coloration and styling solutions in order to deliver salon-quality results at affordable prices.